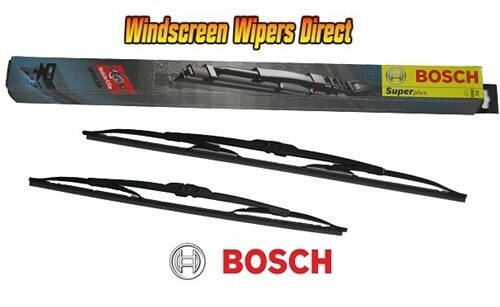 Bosch Wiper Blade Super Plus 28" 700mm/18" 450mm Twin Bosch 'Super Plus' These Bosch wiper blades have an internal tensioning strip for optimum screen contact. The blades are constructed with dual rubber ensuring that they continue to clean effectively for longer. The soft rubber spine enables effective flip over function whilst the hard rubber edge ensures smear free wiping. Each blade comes pre-mounted with Bosch's unique 'Quick-Clip' adapter so they can be fitted to a vehicle in a matter of seconds.